Paloma Lara, a supporter of Uptown United, addresses Inwood stakeholders at the rezoning discussion convened on April 29, 2018. The Inwood rezoning—the fifth neighborhood rezoning sponsored by the de Blasio administration—is exactly halfway through the seven-month public review procedure through which a rezoning is approved or disproved. Manhattan Community Board 12 and Borough President Gale Brewer have each said no to the current plan while calling for certain changes. The City Planning Commission is next to act, followed by the City Council, where Councilmember Ydanis Rodriguez—who originally invited the city to launch the rezoning study—will have a strong say in the final, binding decision. Activities that followed included a panel of local organizations identifying community needs, as well as small-group activities where attendees were asked to look at identified community priorities, add any that were missing and rank them by level of importance with circle-stickers. (The community priorities had been taken from overlapping recommendations put forth in the Uptown United alternative plan, by Community Board 12, and by Northern Manhattan Agenda. It was Stanette, Angelina Ramirez of the Washington Heights Business Improvement District (BID), Charlie Corliss of Inwood Community Services, and some other members of the Northern Manhattan Agenda, who had done the work of consolidation.) The small groups’ recommendations will be posted and subject to further comment. Yet the request for respectful discussion did not deter a momentary outburst of protesting or prevent tensions between participants in the break-out activity. While some stakeholders are more optimistic about the city’s plans, many fear the councilmember will move ahead with a rezoning of a scale they don’t support. If there’s one thing nearly all stakeholders seem to agree with, it’s that the neighborhood needs an abundance of 100-percent income-targeted buildings. The break-out group focused on housing specifically wanted 100-percent income-targeted buildings with 50 percent of units in such buildings reserved for families making less than $34,000. Elected officials have also been eager to secure this demand, with Congressman Adriano Espaillat demanding the mayor identify sites for 5,000 affordable apartments. Rodriguez, while he isn’t committing to a 5,000 target, said at a meeting on Thursday that close to 2,000 affordable units were in the pipeline so far. He is actively seeking more. Brewer told City Limits that the reason she didn’t—in her recommendations on the plan released Friday—heed the call from stakeholders to call for a reduced rezoning and lowered height limits, or to recommend removing the library redevelopment project from the current rezoning application, was because she was hoping to see the rezoning give rise to a number of large, 100-percent affordable buildings. But even if Rodriguez secures additional 100-percent affordable sites, there are still concerns about how a rezoning will impact land values in the neighborhood and whether an influx of high-priced market-rate housing will follow. There also remain strong concerns about how the part of the proposed rezoning that would increase density on Dyckman Street, Broadway and 207th Street might impact the small businesses on those corridors. Rodriguez continues to call for the reservation of affordable commercial space in new developments, and Brewer has suggested either scrapping the rezoning of most of those corridors or phasing in the rezoning overtime after other parts of the neighborhood have developed commercial space, a new idea that local activists were still mulling. Ramirez of the Washington Heights BID, who facilitated the break-out group on economic development, said participants in the activity raised concerns that there are still a lack of sufficient commitments to helping merchants avoid displacement. Some ideas that came up, in addition to the passage of the long-stalled Small Business Jobs Survival Act, included incentive programs for landlords, grants for small businesses and creating a “right of first refusal” to return when buildings are redeveloped within the rezoning area. Paloma Lara, who represented supporters of the Uptown United platform on the panel, spoke passionately against the city’s plan, saying that many of the neighborhoods selected for a rezoning have targeted Black and Brown communities (though there are a couple exceptions), and asking rhetorically, “Do we give our control to our councilmember, who met with dozens of property owners earlier this week in a plea for their support for the rezoning?” It was when Lara was told by Stennett that her speaking time was up, and Lara resisted, that the room burst into chanting. The meeting referenced by Lara was held by the Department of Housing Preservation and Development (HPD) on Thursday to inform property owners about city funding streams available to build affordable housing. At that meeting, Rodriguez spoke about his vision for creating 100-percent affordable housing as well as economic opportunities to help working-class families join the middle class, and urged property owners to help him achieve this vision. He also explained that “99.9 percent” of people at recent hearings had testified against the rezoning and asked the property owners in the room to show greater support for the rezoning. Asked about this meeting, Rodriguez told City Limits on Sunday that he believed it was important to hear from a variety of stakeholders. “I’ve been meeting with all sectors of our community. I’ve been meeting with the nonprofit sector, I’ve been meeting with tenants…I will only do a rezoning when I know how anyone who owns property will be partner to building affordable housing,” and his other goals, he said. Rodriguez wasn’t the only one to argue that more voices—outside of those who support the Uptown United platform—deserve a chance to weigh in on the discussion. 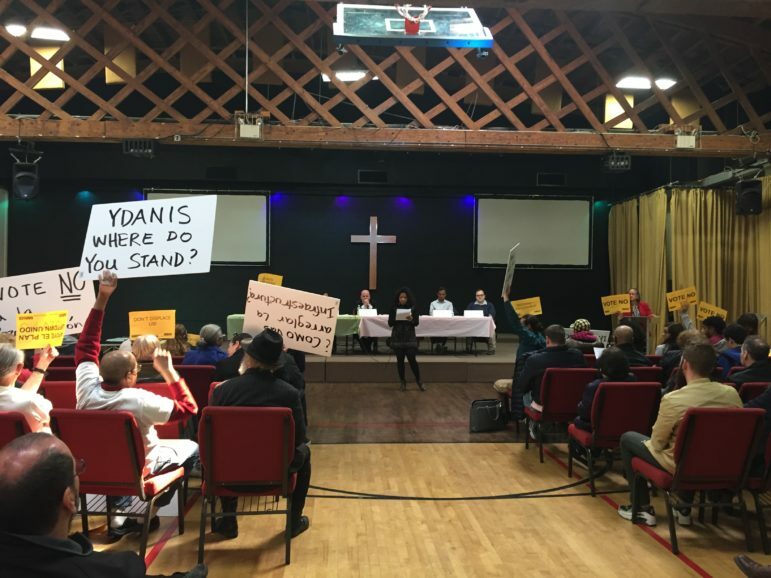 Ana Martinez, a resident, expressed some frustration with the small-group activity, saying that “passionate groups are able to kind of take over” and that she disagreed with those who took an attitude of opposition to the rezoning. “My attitude is, rezoning is coming,” she said, suggesting that rezonings would allow the city to grow and include affordable housing, and that the discussion ought to focus on crafting a plan that avoids “disasters” that have happened in other communities. Asked about this claim, Rodriguez told City Limits there would continue to be meetings like Sunday’s forums open to the entire community. He added, however, that he had found the group’s behavior disrespectful. A couple attendees expressed skepticism to City Limits about the break-out activities, and for Lena Melendez, a supporter of the Uptown United plan, the whole meeting gave her the sense that the rezoning was now an inevitability. “They’re behaving as if it’s a done deal…going through the motions. It’s an exercise in futility. We’re going to get shat on,” she said, adding that the community was being given no choice but to beg for “concessions” like more parking or investments in the electrical grid. Rodriguez said in an interview that nothing was a done deal. It’s the same quandary that’s come up repeatedly in each of the low-income communities of color that have been targeted for a rezoning. Such neighborhoods and their elected officials have had to make the choice of whether the resources, the job opportunities, and the affordable apartments they so desperately need are worth opening themselves up to the whims of the real-estate market, even when the risks of displacement remain poorly understood and improperly studied—and when many newly minted anti-displacement strategies remain untested. This is the perpetual choice, one could say, that is offered up by a free-market economy, especially when under a federal government hostile to the poor. Still, it remains unclear whether the city is doing all it can within the limitations of the era to ensure the most vulnerable are spared harm. Are affluent New Yorkers playing enough of a role in meeting the city’s housing needs? Are alternatives to the current approach to housing development being given a real chance to come to fruition? The City Planning Commission will hold a hearing on the Inwood rezoning on May 9, 2018 starting at 10 am at the City Planning Commission Hearing Room, Lower Concourse, 120 Broadway. You’re right not to want deBlasio’s rezoning/upzoning forced on your neighborhood if the majority of residents are opposed to it. But at the same time you have to be realistic. Where is the money going to come from to pay for 100% affordability? NYC does not have unlimited financial resources. Abigail: Wonderful done article. Factual and to the point. The building that Ydanis Rodriguez is referring to on Broadway and Dyckman Street, that he is offering up to the real estate industry, is where I live! 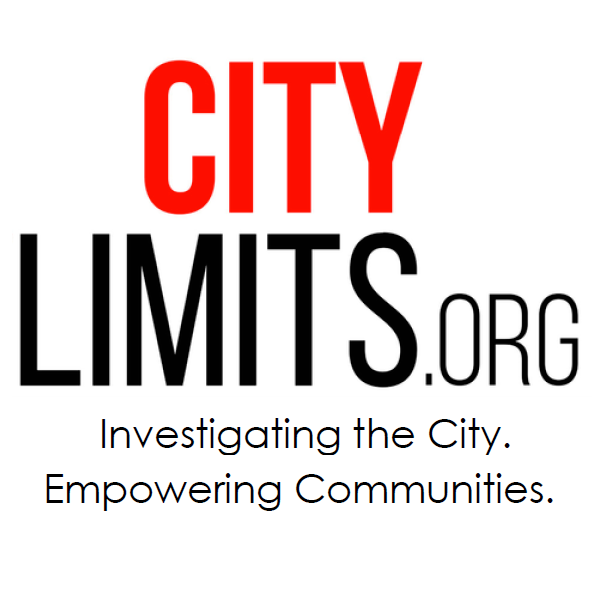 I want to make it clear, in case City Limits has not gotten our point – we are not opposed to the rezoning, we are advocating for a rezoning that will work for our current community as well as for future residents. We have a rezoning plan that clearly lays out how the City can pass an effective and sound rezoning that will not further harm our community while also building the right foundations needed to add new residents to the neighborhood. It is because we understand the actual need for truly affordable housing that we have come together to be able to find a way to go even further than the City has dared to go. We are pushing the City and Ydanis Rodriguez to think outside of the box, to understand that there are ways to build 100% affordable housing. Affordable housing as it relates to our community by providing 50% of apartments for those making less than $34K/yr and not above $88K/yr. These are the tenants and families that are most at risk and the ones that most need affordable housing. 100% affordable apartments subsidized by who? I have felt right along that this project is a done deal and Rodriguez is simply going through the motions, while dealing with the mayor and real estate interests on the side. Don’t trust him. They will sell you out and be gone when the reality hits the fan. Rodriguez is in their pocket. The CM and the city in general have not been willing to seriously discuss any aspects of the proposed rezoning since it came out a year ago. They just hold hearings, say they will listen, and then change nothing. It’s not as if people are absolutely against rezoning of any kind. The goals are good, and Inwood is blessed with plenty of vacant and under-utilized industrial area to convert into attractive mixed-use and residential areas. But because the city refuses to make changes they have forced people into a binary yes-no where people making intelligent, rational critiques are forced into the No camp in the hopes that the city will come back with something better. If the rezoning was less unreasonably aggressive, and went with say 15 story buildings instead of 25 or 30, and included at least some benefits for existing residents in the form of a new park or community center, it would probably sail through. We had an election last year in which Inwood Rezoning was front and center in the campaign. The opposition candidate lost in a landslide, the people spoke. They are against the rampant nimbyism in this community from the minority of people who don’t have the needs, or the values, that the majority has. Opposing tearing down the building where I live is not NIMBYism! And just when you thought the City could not behave any worse in this rezoning process, they did, sneaking in a change in the rezoning proposal that will enable much worse displacement of small businesses and destroy the vibrant commercial district Gale Brewer calls “Inwood’s ‘Main Street’ … the economic and social center for residents” and especially important to immigrants. No one raised this change at last Sunday’s event because almost no one knew about it. EDC buried public notice about in fine print in the middle of a dense paragraph on a web page, requiring scrolling down to find it–if you happen to know it’s there. If Gale Brewer had not referenced these changes on p. 25 of her “Recommendation,” we would never have known to look for it, unfortunately not until after Sunday’s event. Following NYC EDC’s usual pattern of deception, they put a few “good” proposals in this “Technical Memorandum” as cover for a much bigger disastrous proposal: To change the proposed zoning of Broadway, 207 St, and Dyckman west of Broadway in ways that invite big box chain stores (by enabling higher ceilings) and many more commercial uses than currently allowed or even allowed under the initial rezoning proposal, many wholly inappropriate to the local neighborhood “Main Street” district. EDC added only very weak frontage limitations on 207 St & Dyckman east of Broadway to discourage big box stores (much weaker than those proposed by Gale Brewer, Uptown United, & CB12), but even these weak protections are NOT applied to Broadway. So, without any public process, they’re sneaking in replacing Inwood’s “Main Street” with a regional commercial district that no one in the community asked for. City Limits contributor Abigail Savitch-Lew gives a quick primer on zoning policy and the rezoning debate. The borough president explained why he defends Mayor de Blasio, how he feels about Albany’s treatment of Brooklyn compared with other boroughs, and what his approach would be if he wins City Hall. After apartheid, many Blacks left South Africa’s townships in a search for a better life in the big city. Now they see government, landlords and private-security firms banding together to drive them out.